Recently my young friend Leah was traumatised by a spaghetti squash. A few minutes after putting a prime specimen in her microwave, it exploded like a bomb, blew open the microwave door and sprayed half the kitchen with sticky strands of squash. Note: The safest way to cook a whole spaghetti squash is to use a slow cooker. Before baking, steaming or microwaving spaghetti squash, they should be cut in half. Surely such calamities have befallen others, because many cooks and gardeners are trying spaghetti squash for the first time. Most of today's trendiest food labels apply to spaghetti squash – gluten free, low carbohydrate, high in vitamins and fiber, and often locally-grown. 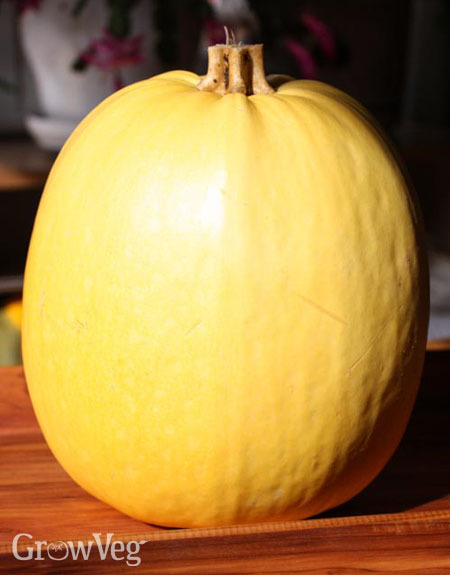 Closely related to summer squash (young spaghetti squash fruits look like short, stout courgettes), spaghetti squash mature faster than most other winter squash, producing mature fruits about eight weeks after planting. Originating in Mexico, spaghetti squash were probably first grown as a companion crops, to cover the ground between hills of corn. Most open-pollinated varieties eagerly run 15 feet (5 metres), often developing supplemental roots where stems come into contact with moist ground. In North America, the supplemental stems serve as the plants' back-up plan should squash vine borers kill the plant's primary crown. Growing spaghetti squash is especially easy of you choose your site ahead of time, and create a customised compost pile into which spaghetti squash seedlings can be planted come spring. Spaghetti squash thrive when grown in a thoughtfully-composed pile of rotting leaves, manure, soil and composted garden waste. Spaghetti squash makes a surprising (and pleasing) addition to egg dishes like omelettes, frittatas, and spaghetti squash fritters – little pan-fried pancakes bound with flour and egg that get slathered with a spicy sauce before serving.